To Recertify, or NOT to Recertify… THAT is the question. I was definitely a proponent of expiring certifications when the topic came up. Why? Because my value as an MCSE was diminished by others who held the same title… from Windows NT. By making professionals renew their certifications we obtained the ability to differentiate between someone with current value and skills and knowledge and someone whose knowledge and skills were obsolete. I am not saying this position is coming back to bite me, only that I am probably at a cross-roads, and I have some decisions to make. Okay, so I have to decide whether to renew my VCP credentials. It is not an easy decision – not because I have not found value in being a VCP (I have). However I have not spent as much time in the past couple of years working with large scale VMware environments, and I don’t know if I would have the time and resources needed in order to study for and pass the exam. It is a tough choice (not on the VCP4, but for VCP5). I am not only on the line for VMware though… I remember when I earned my MCSE: Private Cloud certification with Microsoft Learning. It was cool to be among the first to earn what I consider to be a very prestigious certification. Seeing the words CHARTER MEMBER along the top was not exactly new to me, but I still took great pride in it. Of course, if we look back to the beginning of this article, I would be a hypocrite if I really thought this was an ugly note… it is just the reality, and if I want the renewal to apply to others so that my certifications retain their value, obviously I have to renew as well so that everyone else’s certifications retain their value. The question is though… would I pass the required exams if I sat them today? The answer is, unfortunately, probably not. I can decide to buckle down and study, preparing for the exams. The long-time faithful readers of my blog will know that I have said before that you should not study for exams (see article). I said ‘The best way to know technology is to use it, and if you read the recommended pre-requisites for most exams they say that you should have a minimum of two years experience with the technology.’ Well I already proved that I knew the technologies – I proved it by earning the certs in the first place. However over the last three years my career my priorities were different, and I took extended breaks from using the technologies the certs apply to. Well at least they don’t beat around the bush. On the VMware side I now have just under two months to prepare (if I am going to), and on the Microsoft side I have until the end of October. Will I do it? On one? On both? I don’t know if I will recertify on VMware… Exam prep is tough, and I frankly do not think I get the same benefit out of it that I do Microsoft. That is to say, I do not think that there is an opportunity that I would lose if I said ‘I was a VCP-DCV, but let it lapse.’ Most of my clients are just as happy knowing that I am proficient in VMware, even if the cert has lapsed. Microsoft is a different story. Don’t get me wrong – my reputation with regard to Microsoft technologies is pretty solid. 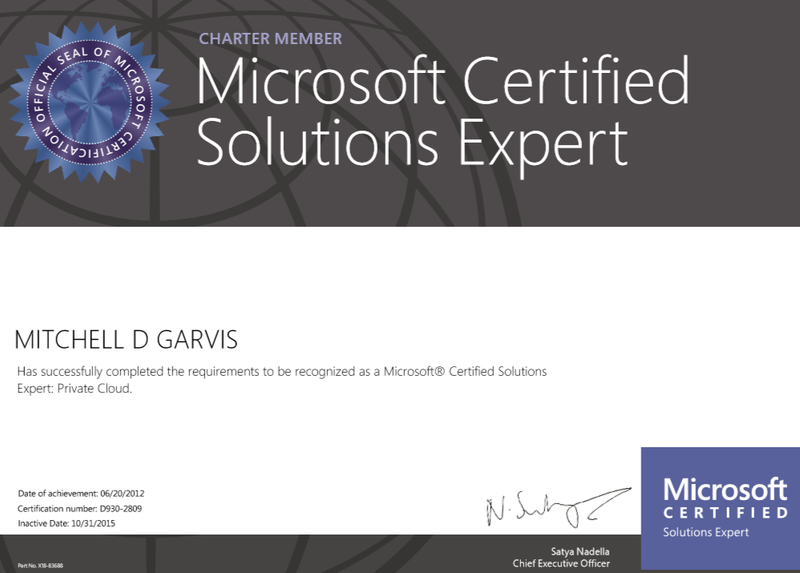 However if I let that cert lapse I do not know if I will be able to renew my MCT (Microsoft Certified Trainer) for 2016 (I just renewed it for 2015, but we have to think ahead). You never know what requirements they will ask at renewal time, and every senior certification on my transcript is a step in the right direction. With that being said, according to the Certification Planner on the Microsoft Learning portal, I am a single exam shy of earning both my MCSA: Windows Server 2012 and my MCSE: Desktop Infrastructure, and one more exam short for my MCSE: Server Infrastructure certifications. (411 and 413 for those who are counting). To recertify for MCSE: Private Cloud I need to write exam 981, which is essentially an upgrade exam (based on the exam objectives for 246 and 247). If you type the term “Upgrade Exam” into the search box of this blog, you can read about how unpleasant those can be. With all of that being said, I passed them once… I should be able to pass them again… I think, hope, pray. Fortunately, I have two things going for me: 1) There is a Second Shot Free offer currently available, so if I fail an exam I can retake it at no cost… well, at the cost of another half-day off of work. 2) As an MCT I am entitled to a 50% discount off my exams. Since MCSE: Private Cloud is no longer offered, I wouldn’t mind holding onto it for the sake of nostalgia. The other MCSEs? Well, none of them would hurt to hold. As for the MCSA… Yeah, I am sure there are a bunch of you who are surprised that I don’t hold that one. When I came back from Japan last year it was my intention to sit a bunch of exams, and I did… but many of you know that my head was very much elsewhere, and what with my personal issues my head just wasn’t in it… I have been one exam shy for a long time, but I do plan to go get it. So I guess during the writing of this article I have talked myself back into a certification mode… who’s with me? ← Cloud Storage: What’s your favourite? I’ll study with you but for 70-534 Architecting Azure. I do agree with you, I think industry exams are important and it “encourages” IT Pros to keep current. Todays technologies are progressing and changing faster than ever and as IT Pros we need to be current to be able to provide the best solutions to our clients, employers etc. Personally, I like prepping for exams, it keeps my brain in gear. Hi, why are you saying that the MCSE Private Cloud is no longer offered? Are they discontinuing it? I am at Microsoft website and still see it being offered. Please advise.